8th June, 2005. In this issue: Site Search, Newsletter Week Special, PlotSwap, Laundry Made Easy for Campers, Adventure classifieds, Focus on Business and Site Stats. When you come to ExplorOz.com, do you often have a question in mind, or a problem you want to solve? The fastest way to find the answer, is to use our new Site Search facility - which is always in front of you no matter what page of the site you are using. Site Search sits in the left margin and just like this live simulation below you simply type in a word or phrase and click go. Did you give it a go? Try it here and be directed to the results list matching your keyword search on ExplorOz. By default, the Results List will find matches across all sections of the site - including Articles, Travel Journal, Trek Notes, Region Overviews, Road Condition Reports, Newsletters, Business Directory Listings, Adventure Shop Products, Digital Map Data Files. Each page found will be ranked, and most are given a summary and a pic making it easy to work out if it is a close match to what you're after or not. You can refine your search by clicking on/off the various sections of the site it can search and click go again. At this point you can also elect to include a search of the Forum Archives. Click the Help button for tips on improving your searching and have fun - we guarantee you'll find pages you haven't read before! This week's Newsletter Special is 10% off all Travel Guide Books. There are 60 products in this category of the ExplorOz Adventure Shop so there's never been a time like now to browse or buy. Remember, this special discount is valid for 7 days only. Click here to browse. Are you an OziExplorer user? 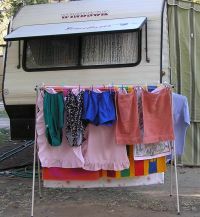 Most people travelling and camping can't stand doing the laundry or avoid it altogether. A cord strung between trees is a common way to dry clothes. However, a new product called Handy Line has been designed to make the drying and airing of clothes and camping gear much easier. Unlike other products, the Handy Line is a tough yet lightweight clothes line that can handle big loads, is simple to operate, and if it rains, can be moved quickly undercover, clothes and all. And importantly, a compact design allows the Handy Line to be stored neatly in most caravans, 4WD and other vehicles. Forget the usual laundry hassles by bringing a weather-resistant Handy Line on your next trip. For more information about this innovative outdoors product click here. Have you got something to sell? Looking to purchase some second-hand equipment. Look no further than the ExplorOz Adventure Trader. Currently there are over 135 listings. In this issue, we feature the "Accommodation" category in our Business Search Directory where you'll find some rather interesting places in Australia. You'll also see that our Accommodation Topic Search page is Sponsored by DriveWA - see their advert in the right margin of the page and click it to go to their site to find their online Accommodation booking engine. Another record month for site usage in May. Over 2 million page views and 20 million hits recorded by over 370,000 unique user sessions. View the Site Stats graphs.